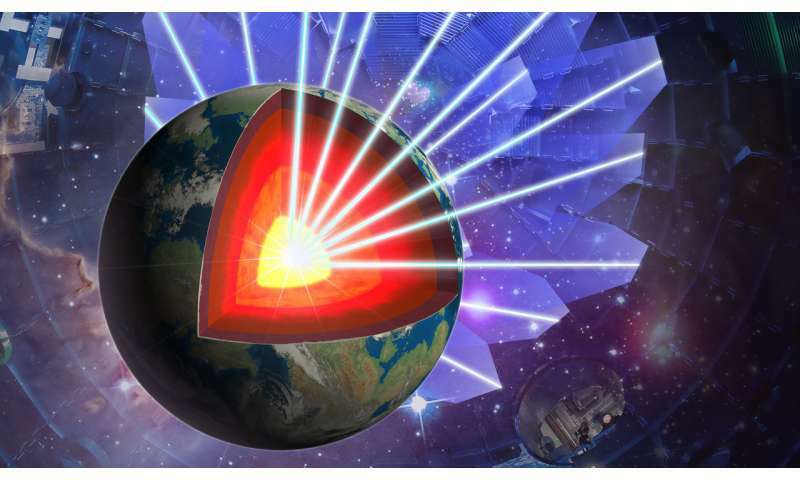 In a paper published today by Nature Astronomy, a team of researchers from Lawrence Livermore National Laboratory (LLNL), Princeton University, Johns Hopkins University and the University of Rochester have provided the first experimentally based mass-radius relationship for a hypothetical pure iron planet at super-Earth core conditions. This discovery can be used to evaluate plausible compositional space for large, rocky exoplanets, forming the basis of future planetary interior models, which in turn can be used to more accurately interpret observation data from the Kepler space mission and aid in identifying planets suitable for habitability. "The discovery of large numbers of planets outside our solar system has been one of the most exciting scientific discoveries of this generation," said Ray Smith, a physicist at LLNL and lead author of the research. "These discoveries raise fundamental questions. What are the different types of extrasolar planets and how do they form and evolve? Which of these objects can potentially sustain surface conditions suitable for life? To address such questions, it is necessary to understand the composition and interior structure of these objects." Of the more than 4,000 confirmed and candidate extrasolar planets, those that are one to four times the radius of the Earth are now known to be the most abundant. This size range, which spans between Earth and Neptune, is not represented in our own solar system, indicating that planets form over a wider range of physical conditions than previously thought. As core pressures for even a 5×-Earth-mass planet can reach as high as 2 million atmospheres, a fundamental requirement for constraining exoplanetary composition and interior structure is an accurate determination of the material properties at extreme pressures. Iron (Fe) is a cosmochemically abundant element and, as the dominant constituent of terrestrial planetary cores, is a key material for studying super-Earth interiors. A detailed understanding of the properties of iron at super-Earth conditions is an essential component of the team's experiments. The researchers describe a new generation of high-power laser experiments, which use ramp compression techniques to provide the first absolute equation of state measurements of Fe at the extreme pressure and density conditions found within super-Earth cores. Such shock-free dynamic compression is uniquely suited for compressing matter with minimal heating to TPa pressures (1 TPa = 10 million atmospheres). The experiments were conducted at the LLNL's National Ignition Facility (NIF). NIF, the world's largest and most energetic laser, can deliver up to 2 megajoules of laser energy over 30 nanoseconds and provides the necessary laser power and control to ramp compress materials to TPa pressures. The team's experiments reached peak pressures of 1.4 TPa, four times higher pressure than previous static results, representing core conditions found with a 3-4x Earth mass planet. "Planetary interior models, which rely on a description of constituent materials under extreme pressures, are commonly based on extrapolations of low-pressure data and produce a wide range of predicated material states. Our experimental data provides a firmer basis for establishing the properties of a super-Earth planet with a pure iron planet," Smith said. "Furthermore, our study demonstrates the capability for determination of equations of state and other key thermodynamic properties of planetary core materials at pressures well beyond those of conventional static techniques. Such information is crucial for advancing our understanding of the structure and dynamics of large rocky exoplanets and their evolution." Future experiments on NIF will extend the study of planetary materials to several TPa while combining nanosecond X-ray diffraction techniques to determine the crystal structure evolution with pressure.